One area the state board has focused on is our C/U Partner members particularly in the area of continuing to foster opportunities for the students at these institutions. Through the efforts of our C/U Liaison Deb Roney and a committee of AAUW members, we have formed the first state Student Advisory Council (SAC) consisting of 3 college woman, one each from the three districts in the state. Their role is to advise the AAUW-PA board on the needs of college students as well as serve as leaders on their respective campuses. Deb has also been successful in appointing two Emerging Leader Interns assigning them to mentors from the state board so these young women can continue to develop their leadership skills as they contribute to AAUW’s work. We will end the fiscal year with around 50 C/U partner members, over 400 electronic Student Affiliate members, and five AAUW Student Organizations, an increase from the 3 we had last year. As always we will award grants to send several college women leaders to the National Conference for College Women Student Leaders (NCCWSL). The state board recognizes that to build and sustain our membership, it is important to engage college women and support them in their leadership development so they can be the next generation leaders of AAUW. Another area of focus was on Public Policy. At the July Summer Retreat we offered a presentation by the Bucks County Women’s Advocacy Coalition and AAUW national staff Grassroots Advocacy Coordinator Deborah Swerdlow on how to build advocacy coalitions in your own community. Our state Public Policy Co-Chairs, Toni Hoffman and Susan McNamara, have done an outstanding job on many fronts. They applied for and were successful in obtaining an AAUW national Public Policy Impact grant which they used to award 10 mini-grants to branches in the issue areas of Common Core State Standards and Economic Sufficiency as well as Get Out the Vote initiatives. Toni and Susan have prepared extensive resources for all branches to use which have been posted on the state website and their hope is that every branch in the state was able to do some activity in Public Policy this year. 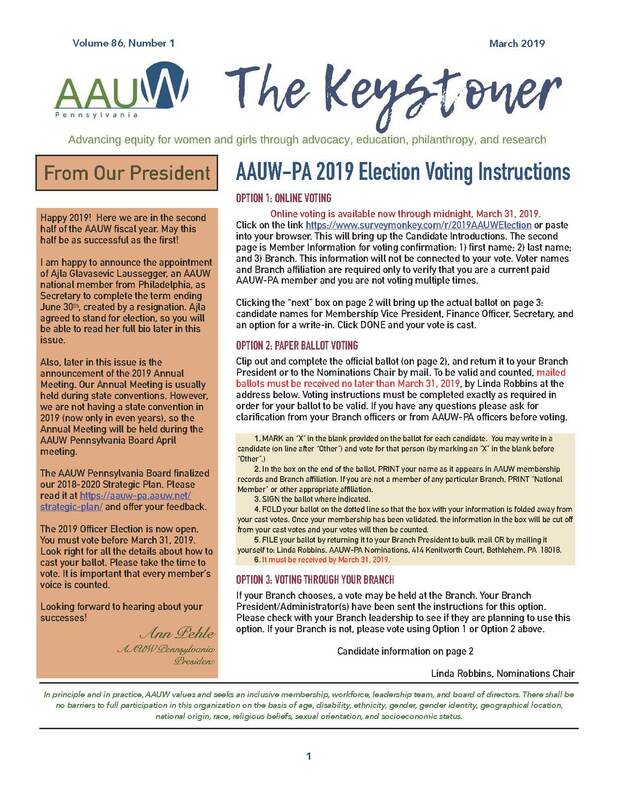 They also sent out monthly highlights to branch Public Policy Chairs to provide them information and ideas as well as resources for contributing to AAUW’s Public Policy initiatives. They scheduled a three day lobbying event in Harrisburg during April preceded by advocacy training in the three districts. And, they have collaborated with the new Education Committee to coordinate efforts in education issues in Pennsylvania including the in-person and webinar advocacy trainings mentioned previously. Special emphasis this year was on the public policy issue of education. At last year’s convention we passed a resolution for a group to determine the feasibility of creating a white paper on the status of public education in Pennsylvania including funding. This group studied the issues and determined that the greatest contribution that AAUW-PA members can make to working towards fair and equal education and funding in the state is to network with existing organizations in this area. As a result, the Education Committee has been formed with Cheryl Towers and Martha Czop chairing with the intention of collaborating with other organizations to focus attention on these issues and their resolution. These women have already been effective in collaboration with the Public Policy Co-Chairs to plan and deliver last fall’s District Meetings, each of which focused on an element of public education. The committee recommended to the state that we join, as an endorsing member, the Campaign for Fair Education Funding which the board voted to support. They have plans for 2015-2016 to continue to build our collaboration with other stakeholders in the state to address this critical issue. We have endeavored to increase our visibility in the state through several avenues. The state website has been revamped to hopefully make it easier to navigate and to become a real resource for the branches, the AAUW-PA Facebook page and Twitter accounts are actively being utilized, and we were once again a supporting organization and exhibitor at the Pennsylvania Conference for Women last October along with other pre-eminent women’s organizations. Barbara Price and Dot McLane represented AAUW in delivering testimony at two separate hearings in support of legislation to strengthen equal pay laws in Pennsylvania. As we approach 2015-2016 our goal as a state board is to continue to support our branches, provide leadership opportunities for college women and AAUW members, and be active in public policy issues in the state including access to quality public education and ending the gender wage gap. Please visit the AAUW-PA website (Communications, Board Officer Reports) to read more about each state board officer’s contribution to AAUW-PA’s work in 2014-2015. This has been another great year for AAUW-PA. Twelve branches increased their membership numbers. Additionally three branches maintained their numbers and thirteen more were down by only one. Statewide, a total of 167 new members joined Pennsylvania branches this year. We have been contacted by several young women throughout the year who have graduated from college and are interested in joining AAUW. The number of student affiliates enrolled in Pennsylvania C/U Partner institutions (e-SAFs) continues to grow as does the number of student chapters. Branches which develop strong ties with C/U institutions benefit from this partnership. And the e-SAFs benefit from their interaction with branch members. This is a WIN-WIN situation. This year, we have explored the possibility of a PA Virtual Branch. Upon graduation, e-SAFs are awarded a one year national AAUW membership. While some PA e-SAFs may move to other states, we see no evidence that the ones who remain are connecting with any of our forty AAUW-PA branches. Hopefully a Virtual Branch would be the answer in retaining them as well as being an option for those interested in joining but do not have a branch close to their homes. For this to happen, we need a core group of current members with computer skills and a willingness to take the lead. Please contact any member of the AAUW-PA Board if you are interested in being involved in this project. Facebook continues to connect branch members with branch members from around the state as well as around the country. This is a unique way of finding out what other branches are doing for public policy, fundraising, member retention and an outreach tool for finding perspective new members. Sharing branch efforts is the way we grow. In the past, members connected with members from other branches only a few times a year. With Facebook, members can have a running dialog with members from other states and stay abreast on important issues. How will your branch increase its outreach next year? And we would be remiss in not reinforcing the importance of the program-membership link. Those branches which are thriving are providing interesting and vibrant programming for both their members and their communities. They are getting the AAUW message out to women who become interested in what AAUW stands for and what we do to promote equity for women and girls. Don’t be afraid to try a Shape the Future event or a Cocktails and Conversations gathering. Keep on running those public policy debates, Great Decisions forums and Voter Registration Drives. Plan it and they WILL come. Persistence pays off. And the winner is … AAUW. As of February 1, 2015, there were 51 College/University (C/U) partner members, an increase of one since the same time last year (the comparison point for all further statistics here). Thirty-eight of them have student affiliate members, an increase of seven. Although seven institutions (Clarion University, Harrisburg University of Science and Technology, Lehigh Carbon Community College, McCann School of Business and Technology, University of Pennsylvania, Villanova University, and Wilson College) dropped their C/U membership since last year, eight new or returning institutions joined: Cheyney University of Pennsylvania, Delaware Valley College, Duquesne University, Indiana University of Pennsylvania, Mansfield University, Muhlenberg College, Philadelphia College of Osteopathic Medicine, and Temple University. See the list below for details. This year, there are seven branches with C/U chairs (Doylestown, Easton, Gettysburg, Huntingdon, Lansdale, Lebanon Valley, and North Hills-McKnight). Additional branches are considering adding one. We need to improve in this area. AAUW lists Pennsylvania as having 431 student-affiliate members attending college across the state at 43 institutions, an increase of 247 students and 12 institutions. Most of these individuals are at C/U member institutions, but there are five non-partner schools that have SAFs (or eSAFs) on campus. An additional 40 PA residents are eSAFs attending school out of state (an increase of 16) and 24 students list PA addresses but no college or university (an increase of seven). This gives a total of 495 student affiliates with a connection to PA.
Pennsylvania increased its registered AAUW Student Organizations (SO) this year from three to six: Delaware Valley College, Gettysburg College, Juniata College, Moravian College, Lock Haven University, and Penn State University — University Park Campus. There are also core groups of ten or more student affiliates at four other schools. We encourage them to register as AAUW Student Organizations. To ensure that student affiliates (SAF) become involved with AAUW after graduation, e-SAFs need do nothing; they automatically become national members-at-large for the next year. However, graduating students affiliated through a college or university that is not a partner member of AAUW (SAFs) or those who have not connected previously with AAUW can become national members-at-large for free through the Give-a-Grad-a-Gift program; a current member needs to make that request. Although selections for membership on the AAUW National Student Advisory Council (SAC) were made, no Pennsylvanian was selected this year. Since the program’s inception in 2007, Pennsylvania has had five SAC members. These SAC members advise AAUW of student needs and ideas, promote AAUW on campus, and serve as student leaders at the annual National Conference for College Women Student Leaders (NCCWSL). Cheyney University of Pennsylvania for its project “My Life, My Label.” The project won one of this year’s Campus Action Project grants, now sponsored by Pantene, which focus on stereotypes and bias; the theme is “Sorry, Not Sorry: Gender Stereotypes and Biases.” They will address stereotypes about women of color and explore the biases women have against each other through a visual campaign. Since 2005, nine Pennsylvania institutions that have been awarded a CAP grant. Kaitlin Sweeny (Lock Haven University), a senior majoring in Communication (advertising, public relations, and professional communication) and minoring in Business Administration. Sweeny’s mentors are Talat Azhar and Connie Schroeder. Brittney Zeller (Lock Haven University), a junior majoring in English and Political Science. Because of her interests in public policy, voter education, and Get-Out-the-Vote initiatives, Zeller’s mentors for her internship this year are Toni Hoffman and Susan McNamara. University of Pennsylvania for being the only one of the 50 nationwide Elect Her — Campus Women Win training sites located in PA. The District East Meeting was held October 18th at the historic Uwchlan Meeting House in Lionville, PA. The meeting was hosted by the West Chester Branch of AAUW. We had 12 of the 17 branches represented with 42 members actually there. The morning topic for discussion was “Is Public Education Fairly Funded?” We had two terrific speakers to this topic: Ms. Susan Gobreski, Chief Executive of Education Voters PA in Philadelphia, and Mr. Ian Gavigan from the Education Law Center in Philadelphia. Fran Pierce (West Chester Branch) gave us a bit of background on education funding through the years. Both speakers took turns presenting information on public education and used power point slides to emphasize facts and figures. Pennsylvania ranks 47th in the nation as to what the state contributes to the school districts. There are 501 school districts in PA so it takes huge amounts of money to the school districts in order to make a difference. In 2011, one billion dollars was cut from the education budget and those cuts have not been restored. The final answer to the question “Is Public Education Fairly Funded?” was a resounding no. Pennsylvania needs a funding system that is equitable and efficient to fairly fund the many districts. So much information was gleaned from these two speakers and we thank them so much for their time and information. After a delicious lunch, Susan McNamara and Toni Hoffman, PA Public Policy co-chairs, spoke to us about GoTV, and using social media to attract new, younger members. Both Susan and Toni repeated that they are there to help the branches with any public policy issues that they may have. Sixteen members and guests attended the AAUW-PA Central District meeting in the ShadowStone Community Center, Palmyra, Lebanon County, on Saturday, October 18. The Lebanon Valley Branch hosted the event. The morning kicked off with a lively discussion of the perceptions surrounding Common Core standards and / or curriculum. Dr. Stacy Winslow and Dr. Bernie Kepler, Assistant Superintendents and curriculum leaders of Derry Township and Palmyra Area School Districts, respectively, presented this portion of the day’s program. They shared some of the history and implementation of PA Common Core Standards by local school districts. They agreed with AAUW’s support of public education that ensures that students graduate with skills that will allow them to be successful in their next steps and to be competitive in a worldwide economy. The speakers likened Common Core Standards to the “building code” around which to build a curriculum, and the teachers and administrators as the “architects” of the curriculum. All present agreed that too much time and money are being spent on testing. Many expressed frustration at the time expended as the standards are tweaked to meet political agendas. After lunch we heard a presentation by Dr. William Davidson entitled Income Inequity is Destroying America. He shared statistics from the beginning of the twentieth century showing how wages for the middle class have eroded with each period of depression / recession. The richest 1 % of Americans currently account for 40 % of the wealth. Because of their isolation from the working class, the middle class, and the working poor, by whatever definition, there is little reason for these people to change the distribution of wealth. This inequitable division of resources threatens our democracy and the social fabric of our society. Because of the gender pay gap, women are losing even more in this changing and struggling economy. Participants broke into small groups at the end of the sessions to discuss their impressions of the materials presented. Many felt that branches can create awareness of these issues through branch programs, symposiums, or distribution of written materials to the public, writing letters to the editor, or by contacting legislators. Several members of the Central District volunteered to assist Linda Robbins, AAUW-PA Archives Chair, in organizing items at the PA State Museum. The Public Policy chair of the Carlisle Branch arranged for a venue for the AAUW-PA Effective Advocacy Training for the Central District, and the branch hosted the event. Thirteen participants with a wide range of interests attended on a very icy morning, from League of Women Voters to Director of Advocacy for the YWCA, Public Policy Chairs and members from York, Harrisburg, and Lock Haven, plus two candidates for local elections. I established communication with the state archives, where much of our history is stored. After several visits, I have become a permanent volunteer and have more privileges than most in reviewing, reorganizing and reboxing the materials they already have. I am slowly sorting all of the files and moving to acid free files and boxes. To date, all past yearbooks, newsletters and any other like communication is filed, labeled and complete. I am currently working on specific branch files in two categories; current and former and moving data from unsorted to its proper location. I still have many boxes at the archives in Harrisburg to complete and I try to stop by four times a year for 2 days. I still have more data to sort and transport, but expect to have completed by end of 2015-early 2016. A second project is to complete the history that was passed on from each board and determine where this is to be posted. And a third to complete a history of previous Award winner for the web. I have also met with many branches; Huntington, Eastern Delaware County and Bethlehem to assist in archiving their materials. Branches have a choice of depositing past records with the state (I can facilitate transfer) or their own local Historical Society. I have several requests for assistance in the future.